This year the Levy Preserve interns embarked on a two-week scientific and cultural exchange with New York's Natural Areas Conservancy (NAC). 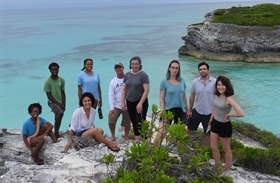 Site visits to Eleuthera and New York allowed each group the chance to gain first-hand knowledge of natural resource management and scientific research methods in the respective locales. NAC's Senior Ecologist Helen Forgione and her team of interns and advisors spent one week on Eleuthera receiving an ecological overview of the island. They toured key heritage and conservation sites including the Levy Preserve, Lighthouse Point, Sweeting's Pond and the Glass Window Bridge. During the group's tour of the Levy Preserve the Eleuthera interns ably assisted with plant identification using their newly acquired botanical knowledge. Next, it was the Eleuthera team's turn to visit New York. Accompanied by their instructor Dr. Ethan Fried the group enjoyed visits to the Wildlife Conservation Society, the Greenbelt Native Plant Center and the herbarium at the New York Botanical Garden, the second largest in the world. Rounding out the week were stops at Forts Tilden and Totten with some downtime to enjoy the sights and sounds of the Big Apple. The intern's individual research projects will be presented at a closing reception at the Bahamas National Trust in New Providence. The Natural Areas Conservancy is a non-profit organization devoted to restoring and conserving New York City's forests, wetlands and coastal areas.